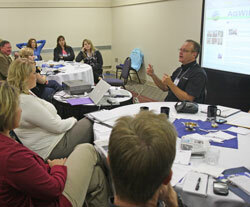 Thanks to Ted Quanrud, North Dakota, I’ve got a picture from my COSDA blogging class. We went at it hard and heavy for 4 hours and had a great discussion (even though the hotel’s internet access died right when I started). Today we’re going to focus on podcasting and I’ve opened up lots of web pages “just in case.” After our session I’ll be heading up to Omaha for an EPIC meeting but I’ll be back on line later this evening.